In her late thirties, Madeleine L’Engle wrote that line in one of her journals to express her lifelong fears about fitting in socially and becoming an accomplished writer. This new middle grade biography by her granddaughters, the sister duo Charlotte Jones Voiklis and Léna Roy, follows Madeleine (as they always refer to her) from her somewhat lonely childhood up to her early forties, when the manuscript that would become A Wrinkle in Time was finally accepted for publication. Voiklis and Roy take the professional image of their grandmother – the woman who published over forty books (most for young adults), won the Newbery Medal and the National Humanities Medal, and penned one of the most beloved children’s books of the 20th century – and reveal how her personal struggles and insecurities shaped her into the wildly successful figure the world recognized. She maintained this dedication to her craft and her belief that she had something to say to readers through the ups and downs of her early literary career, which she faced alongside the ups and downs of early motherhood. At the age of thirty-one, after publishing several decently-received books, Madeleine summed up her situation as follows: “If [my agent] doesn’t like this [next] book there is no need for me to lose faith in myself and my work, but it’s been too long since anything I’ve written has been considered acceptable; I’m in desperate need now of encouragement, not discouragement.” But there was plenty more discouragement in store as she attempted to sell a manuscript she referred to as Mrs. Whatsit (which would be renamed A Wrinkle in Time). Madeleine believed in this project more than any other she’d undertaken, but publishers were unwilling to take a chance on a book that was so difficult to categorize. Voiklis and Roy recount these tales matter-of-factly, imparting very little external emotion on each story, but using slightly elevated language that mirrors their grandmother’s confidence in child readers. 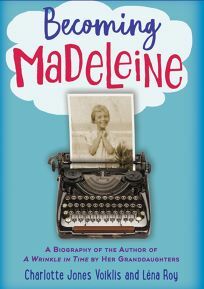 As the biography continues into Madeleine’s adult life, details about her relationships become fuzzier, as the authors themselves acknowledge in a note at the back, explaining, “[W]e wanted to respect the privacy of her journals and travel gently through them, especially those from the time we knew her.” This results in some elisions that will jump out to adult readers, like the tantalizing but unexplored detail that Madeleine’s children resented the autobiographical way she portrayed their family in her popular novel Meet the Austins. Despite the attention paid to her childhood emotions, her adult emotions, especially concerning her personal life, are glossed over, leaving the impression that only those less intimately connected to their biographical subjects could write the kind of invasive, tell-all portraits older readers crave. But this lack of teeth for adults allows Becoming Madeleine to maintain its optimistic tone, leaving its intended child audience with plenty of entertaining stories and encouraging takeaways. Voiklis and Roy show that Madeleine may have always felt like a misfit, but ultimately she embraced that identity, channeling her joys, quirks, and fears into her characters – many of whom became iconic misfits. In the end, the qualities she didn’t love about herself were often the ones that endeared her stories to her young readers, and gave them hope that they, too, could fill their lives with adventure, purpose, and wonder.